Last night, the inaugural Arrell Food Summit wrapped up in Toronto with a dinner and cocktail reception at the Four Seasons, honouring the first-ever recipients of the Global Food Innovation Awards. The first annual ceremony celebrates organizations and individuals who’ve made a difference in the global food security, awarding two $100,000 cash prizes honouring excellence in community engagement and scientific research. Evan Fraser, director of the Arrell Food Institute, told guests that Guelph artist Linda Chidwick made a stained-glass gift for each of the winners that depicts OAC 21 barley, a century-old heritage grain, while Guelph engineering professor John Phillips and his students created the awards on a 3-D printer—the prizes unite the past and the future, which is exactly what the Summit wants to do for food. The menu stuck to all things fresh, local and sustainable: guests dined on heirloom and Oka salads, Ontario beef tenderloin, Yukon Gold and sweet potatoes, and rhubarb tarts with lavender ice cream, and each person received a jar of Summer Blossom Honey made at the University of Guelph’s Honey Bee Research Centre. During dinner, guests heard remarks from Lawrence MacAulay, the federal minister of agriculture and agri-food. “The challenge before us is to produce 50 per cent more food by 2050,” he said, recognizing the scientists, policy makers, farmers and entrepreneurs who’d spent the last three days brainstorming solutions. “To do that, we need a global industry that is strong and stable. To create prosperous farms in Canada, we need trade that is open, fair and science-based. And we need innovation,” he explained. The first annual Arrell Global Food Innovation Award for Community went to Solidaridad Network, the worldwide organization that invented the concept of fair-trade goods. They work with thousands of farmers and artisans around the world to create socially responsible and sustainable global supply chains. 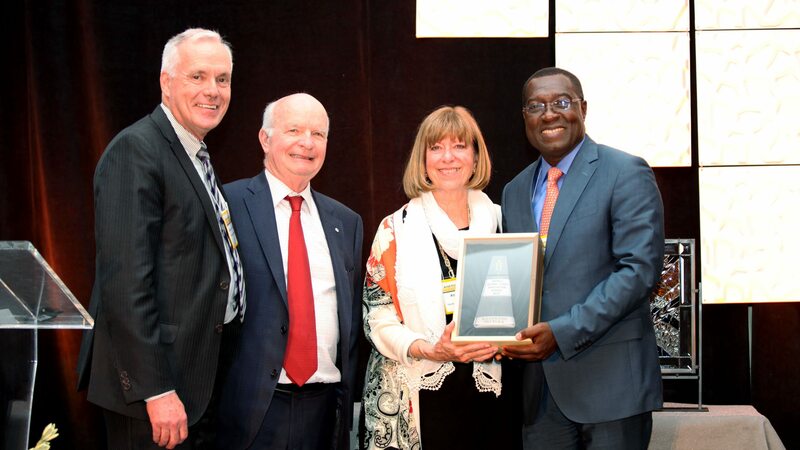 Accepting the award were Isaac Gyamfi, managing director of Solidaridad West Africa, and Sebastian Teunissen, managing director of Solidaridad North America, who graduated from the University of Guelph with a B.A. in economics and math. “I feel like the prodigal son,” he said about returning to his alma mater.